Carolyn Hamilton-Kuby was very friendly and encouraging, helping us navigate the world of weddings to find what worked for us. She made great suggestions, including a hand-blessing that really suited us and that we wouldn’t have found otherwise. It made our wedding that much more special and right for us. She also gave us great advice on how to manage anxiety so that the days leading up to our wedding and the day of went smoothly. Carolyn was punctual, dressed nicely, and socialized well with the guests. She made us feel comfortable and helped ease our nerves. We knew we could count on her to make the ceremony go smoothly and naturally. She has great interpersonal skills and a natural friendliness that made her a great officiant and we are so happy she was assigned to us! Carolyn made our day special and greatly lowered our stress levels. When we had issues with Erro signing the documents, Carolyn quickly kept things under control and eased our worries, reassuring Erro that the document wasn’t void. We both are so happy everything went smoothly and we were able to enjoy the experience together. Carolyn’s tips and willingness to improvise as the ceremony went on were super helpful. We didn’t have a strict plan in place and she just went with the flow with ease. Also, all the emails back and forth with her reassurance that things would just happen naturally were hugely helpful. Time management was Great! We met right away, and emailed frequently before the day of the wedding. We were very impressed with the promptness in responding to emails. 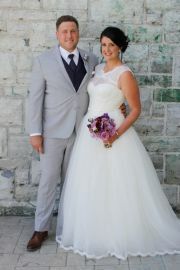 We would recommend Carolyn as a wedding officiant without hesitation! Thank you so much for everything, Carolyn! We can’t thank you enough for making our day so wonderful! Carolyn Hamilton-Kuby always gave off a confident, professional and reliable vibe. We knew after speaking with her that her officiant services would be one less thing to need to worry about in an otherwise crazy planning time crunch. The example ceremonies Carolyn gave us were good and having the flexibility to modify them to suit our needs ensured our ceremony perfectly tailored to suit us! Carolyn's timing was great, up to and including the day of the ceremony. For our meetings she was was very flexible for where and when we could meet. She was always easy to get a hold of and left us feeling reassured that there would be no timing issues on the big day. On the wedding day, Carolyn arrived thirty minutes beforehand, she was polite and introduced herself warmly to friends and family. 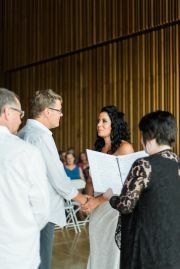 She read and spoke in a warm, natural, friendly manner that set helped the tone wonderfully for our ceremony. Carolyn was professional, outgoing and extremely friendly! The most valuable part was knowing we had someone reliable and professional that we could rely on to make sure our ceremony went off without any issues. She made the stresses of wedding planning that much easier. 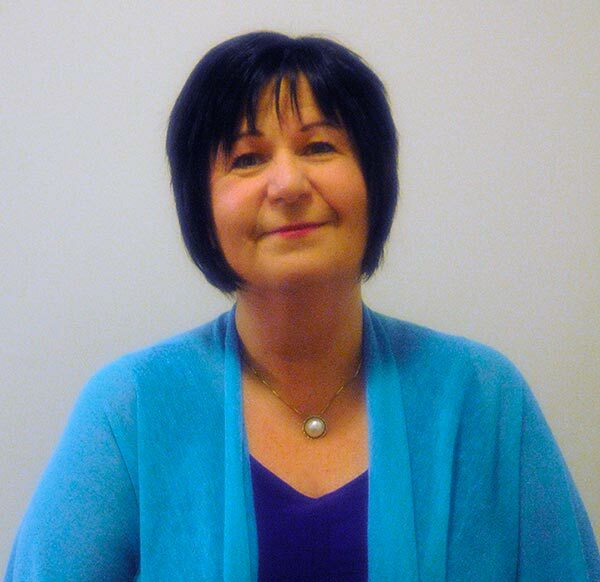 We would recommend Carolyn as an officiant to any of our friends or family. Carolyn was our officiant at our wedding this past August. Simply put she was wonderful! She helped guide us through the somewhat daunting task of writing our vows and putting together our ceremony. As well she also has some amazing stress handling techniques to manage everything coming up to and during our special day. She met with us several times in person, and on the phone and really got to know us and what we wanted for our wedding down to the last detail of having our son as part of our signing of the register. She then set the tone at the ceremony perfectly to match our desires and reacted with us, our speakers and our guests so that everyone felt included and a part of our ceremony. We had so many wonderful comments from our guests about her. We would highly recommend Carolyn, not only was she professional but she was so friendly caring and like a friend through the entire experience. Thank you for making our day so very special and everything we could have ever wanted! Carolyn Hamilton-Kuby was informative and enthusiastic every step of the way. She was always there to answer questions and calm our nerves. Carolyn did everything in her power to make the process smooth for us. She was awesome! Rob and I blended immediately with Carolyn Hamilton-Kuby, coffee at Starbucks, lots of smiles and me holding back a few tears. She is beyond amazing. She related immediately with us as a couple and our blended/extended family. She was not our officiant, she was the bonding method of our journey, so much warmer and better than I would have ever had expected. Looking forward to her renewing our vows in 2026. Carolyn is absolutely delightful. She has a great personality and a positive attitude on life. She is bubbly and outgoing and very personable. We are so happy to have had the opportunity to meet Carolyn and have her perform our ceremony. Thank you again Carolyn for everything. Carolyn Hamilton Kuby exceeded all expectations. She helped us create a beautiful ceremony, she made an impression on our families in a very short time, and she made our ceremony run perfectly and smoothly. Carolyn Hamilton Kuby was a DREAM - the most responsive, professional, encouraging and warm woman possible. A fantastic addition to our special day. Carolyn Hamilton Kuby was absolutely fantastic! She was very professional yet personal. We warmed to her immediately with her caring and friendly attitude. She was very prompt in responding to phone calls/ emails and did everything she could to help out with questions or concerns. At our planning meeting she asked questions that we hadn’t even thought of, which helped the ceremony flow so smoothly. She calmed our nerves through the ceremony and offered a tissue for some tears. Overall we couldn’t have been happier with her! There are few days in life more memorable (and stressful) than one's wedding day. When it comes to the ceremony, Carolyn Hamilton-Kuby delivers a beautiful, eloquent service that is customized perfectly to suit you. When my fiancé (now husband) and I first met with Carolyn, we felt an instant connection. Her professionalism combined with a warm and genuine character made us feel instantly at ease. It was obvious that she truly cared about making our special day reflect us as a couple. With all of the stress involved in planning a wedding, we were very confident that our ceremony was in good hands. She was our rock. Sure enough, when the big day came, Carolyn delivered our ceremony with grace. The ceremony's message was suited just for us, making it even more memorable and special. It was a beautiful start to our beautiful day, and we are forever grateful. Carolyn Hamilton-Kuby went above and beyond our expectations. She was always there to answer any questions we had along the way. She helped my husband and I deal with our anxiety on the day of the wedding. As I was walking up to the isle everything started to hit me, Carolyn waited till my bridesmaids were at the end of the isle and as i approached the isle anxious and gasping for air she ran up to be and took the time to calm me now. She was understanding and knew everything had hit me at that moment. Some people might of let me walk down the isle freaking out the way I was, but I will always be eternally grateful that Carolyn came up to calm me down before I walked down the isle. Carolyn is a great officiant and the best decision we made for our wedding. She was there for us from beginning to end and again afterwards. Thank you Carolyn we are so grateful and had a great day, thanks to you.